The home Braves sweep dual meets with Estacada and Woodburn at Banks High School. It was a long winter break. 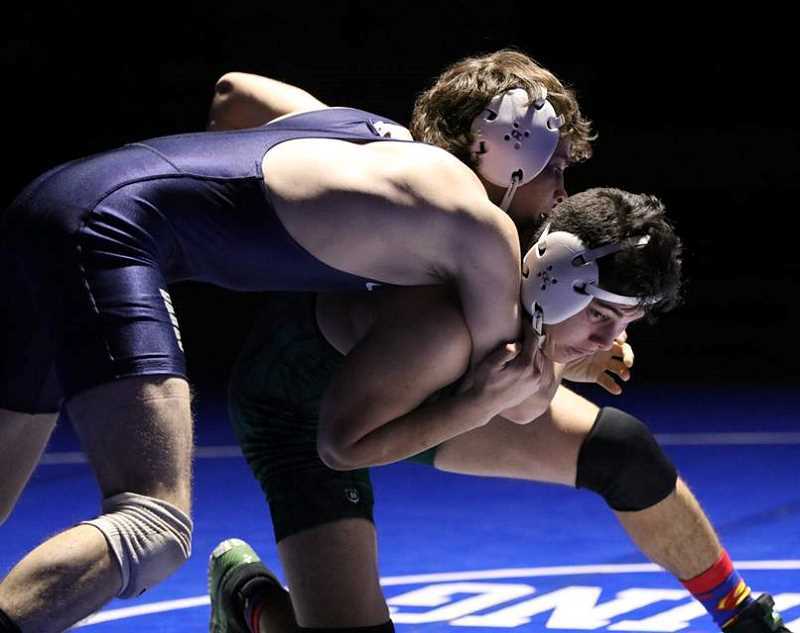 Nonetheless, with the holidays in the rearview mirror, the Banks Braves wrestling team christened the new year with dual victories over both Estacada and Woodburn, Wednesday, Jan. 9, at Banks High School. "We wrestled okay," said Banks head coach Dan Herb. "We won our duals which is always our ultimate goal. We're still working ourselves back into shape after the holidays, but for the most part they competed well and hard, and pulled out a couple tough matches at the end." The Braves opened the night with a 48-36 win over Woodburn, then followed that up with a narrow 37-36 victory over Estacada. The dual triumphs come on the heels of a fairly successful run a the Hilhi Invitational, Jan. 5, where Banks put four kids in the finals of the 10 team event that featured mostly 6A and 5A schools, claimed three titles, and had a second. One of the champions was Hunter Smith at 106 pounds, and Herb said the freshman — who had a 15-3 record following Wednesday night's duals — has really impressed to this point in the season. "He's wrestling really well," said the coach. "It was good for him to win at Hilhi. He'd taken third at a couple events so it's good for his confidence to get that win. We're just working on a couple technique things with him, but we know what we're going to get from him." Banks is 6-0 in duals to this point, and is getting solid contributions throughout their lineup. Herb mentioned captain Tanner Thompson as a guy who they expect a lot from, and the senior has met those expectations both on and off the mat. In addition, Thomas Cook — who took last year off — is back and wrestling well, and the coach believes he'll reach an even higher level when he works himself back into shape. "He's a big, strong, physical kid, and now that he's starting to get his conditioning back, he's wrestling well." Another strength has been J.J. Ellis. The returning state champion is 18-1 thus far, with his only loss coming at the Liberty Invitational last month. "J.J. has set a pretty high standard," said Herb. "We know we count on him and he's familiar with the process. We needed a pin from him late last night and we got it." Against Estacada, every match ended by fall. Despite the victory, Herb said one of the things they're working with their kids on is to wrestle with decisions in mind. Points are important, especially in duals, and avoiding a pin even in defeat, is better than suffering a fall. "We're really preaching to the guys how important it is not to have that 'pin or get pinned' mentality," Herb said. "Sometimes you've got to win or lose by decision, especially in duals. The kids will figure it out, and they actually made some nice adjustments in the second dual." Now, with regionals less than a month away, the coach is pleased with his team's performance to this point, but is additionally preparing with an eye on peaking at the right time. "We're wrestling well as a team," he said. "Were not where we need to be yet, but we're moving in the right direction and hope to be ready to go by regionals a few weeks from now."